Mount Olympus massif is bounded by the following villages and or towns: Litochoron, which is the eastern gate to Mount Olympus, Dion, Vrontou, Petra, Kokkinoplos - the western gate to Mount Olympus, Kalyvia, Olympiada, Kryovrysi, Sykaminea, Karya and Leptokarya. From the circum Olympus settlements some have existed since the ancient times (Leivithra, Pythio, Ancient Dion) demonstrating significant archaeological interest, while others have been created either as a product of internal migration and/or for agricultural purposes. The circum Olympus route is a160km long trip on paved road that provides a very special feeling about the mountain itself and the cultural variety of the settlements within its vicinity. Most important, traveling around Mount Olympus enhances the appetite for subsequent ascents to the mountains highest peaks. 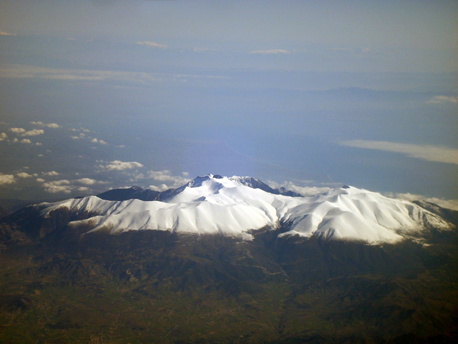 The western slopes of Mount Olympus as seen from "air".